The Texas Governor's Mansion is located at 1010 Colorado Street (the corner of Eleventh and Colorado) in Austin, Texas, about 300 yards southwest of the Capitol. It is the fourth oldest executive residence in the United States and the oldest such structure west of the Mississippi. Built during the years 1854 to 1856, this historic edifice, now a registered National Historic Landmark, has been occupied by every Texas governor since 1856, beginning with the fifth governor, Elisha Marshall Pease (a lawyer and judge who at the time of his election as governor was a resident of the town of Brazoria, then the county seat of Brazoria County, which he had represented in the first three legislatures following annexation). Over the years, it has been maintained by many that besides governors and their families, several spirits have made the stately home their abode as well. The Governor's Mansion was one of several imposing public structures built in Austin by the state government during a period of accelerated construction activity. Before the construction of the present governor's mansion, governors and their families resided in quarters, at hotels or boardinghouses, rented by the state when the legislature was in session. The Texas legislature, on February 11, 1854, appropriated $17,500 (of which $2,500 was for furnishings) to construct a residence and outbuildings suitable for the chief executive. The governor, the comptroller, and the treasurer composed a commission to decide on dimensions, architecture, and furnishings of the mansion. Governor Pease led the building campaign which, besides the mansion, included the state General Land Office building (upon annexation, Texas maintained ownership and control of its public lands) and a new Capitol (the "Old Stone Capitol," which burned on November 9, 1881). The mansion is one of three impressive and stately Austin residences that were designed and built beginning in the early to mid-1850's, in the Greek Revival style and featuring Ionic porticoes across the front, by prominent architect and master builder Abner Hugh Cook, who had been working as the contractor on woodwork in the Capitol building (built in 1852-'53). (The other two aforementioned homes were for the State Treasurer James H. Raymond and the State Comptroller James B. Shaw. Governor Pease in 1856 purchased the home of Shaw and named it Woodlawn.) The executive residence is made of locally manufactured brick, probably from Cook's own brick kiln on the banks of Shoal Creek. The pine logs used for the pillars were hauled in from Bastrop where Cook was a part owner of a lumber mill. In June 1856, Governor Pease moved in. Elisha M. Pease was succeeded as governor by Hardin R. Runnels, a nephew of a former governor of Mississippi. In the gubernatorial election of 1857 Runnels defeated the hero of San Jacinto, former general and twice president of the Republic of Texas Sam Houston, thus becoming the only individual to defeat Houston in an election. Hindered by his anti-sectional votes in the United States Senate, Houston was bypassed as the Texas Democratic Party's candidate, forcing him to declare himself an independent Democrat. Runnels's record as governor and somewhat extreme political views caused a turnabout in the governor's race of 1859 wherein, during a lull in the heated sectional contentions, Sam Houston defeated Runnels. During Houston's term in office, Abraham Lincoln won the presidential election and within a week of a special session thus called by Houston, wherein he warned of the dangers of secession and civil war, the state secession convention convened. Refusing to take the oath of loyalty to the newly established Confederate States of America, Houston was removed from office and replaced by the lieutenant governor Edward Clark. After leaving the Governor's Mansion, Houston moved his family to Huntsville, where in their rented two-story home (known as the "Steamboat House" for its resemblance to a steamboat) he died from pneumonia on July 26, 1863. It is said that Sam Houston's ghost haunts the Governor's Mansion, more specifically the bedroom which he occupied while in residence as governor and for which he bought the mahogany four-poster bed with which it is furnished. It was not long after his death that visitors to the mansion began to report catching glimpses of the old hero whose image would vanish when spoken to. 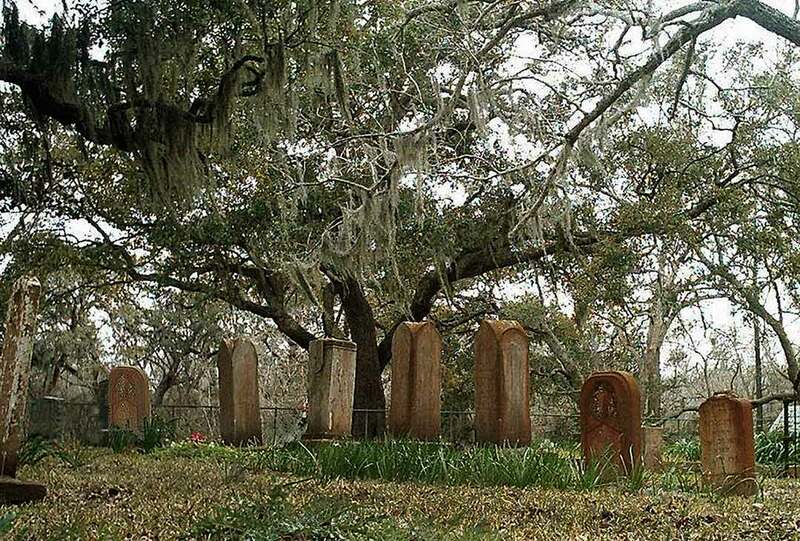 One author supposes that Houston has returned to the mansion because his spirit is haunted by thoughts of the tragic historical circumstances which led to his early departure from his lofty position. Another published account of the haunting states that Houston's shadow lurks in a corner of this particular room. In the mid-1980's the wife and the daughter of Governor Mark White encountered Houston's presence. Elizabeth White, the governor's daughter, stated that something about the bedroom across the hall from that of her parents frightened her and so she avoided it. The bedroom in question, of course, was that which had been Houston's. First Lady Linda Gale White, too had an experience that has been attributed to Houston's restless spirit. Awake later than others in the home, she turned off a light in the Houston bedroom which had been left on over the portrait of Houston before retiring to bed. The first to rise the next morning, she was surprised to find the door to the bedroom wide-open and the light turned on. Another version of the story states that one night the First Lady made several attempts to keep the light off, but a few minutes after turning it off the light would turn back on. The best known ghost story of the Governor's Mansion concerns a suicide. The third and final Confederate governor of Texas was Pendleton Murrah, who like Sam Houston made his departure from Austin before his term was over. Murrah was born in Bibb County, Alabama, around 1826, the son of Peggy Murrah, daughter of Charles and Avarilla Jones Murrah. Raised in an orphanage, he was educated by a Baptist charitable society and graduated from Brown University in 1848. He returned to Alabama where he was admitted to the bar. Having contracted tuberculosis, he moved in 1850 to Texas seeking a dry climate, and began the practice of law in Marshall. There he married Sue Ellen Taylor, daughter of John Bayliss Earle Taylor, a wealthy planter. Murrah lost his first bid to get elected to the legislature but won in 1857. His health affected his public service somewhat until 1863 when he ran for and was elected governor. Stories differ concerning the relationship to Governor Murrah of the individual who brought his own life to a close by a gunshot to the head in the Governor's Mansion. Some stories say he was a young man (generally stated to have been nineteen years old toward the end of the war at the time of the tragedy) who met the governor's niece, fell in love with her yet was rebuffed when he proposed marriage. Other stories have it that the young man was the governor's nephew. In some accounts, the young woman is said to be a niece of the governor, and the suitor her cousin. Yet another ascribes the girl as the niece of Mrs. Murrah. The relationships seem to differ with the story teller! All the stories tend to agree on the point that the rejected admirer was staying in the mansion in the small north guest bedroom and the very night that his affections were spurned, he ended his life there. The stories state that in a very short time anguished wails and moans could be heard in the bedroom and that servants thus refused to enter the room to clean the blood splattered walls. The room was often found to be ice-cold, and due to a mysterious banging noise no one could ever sleep therein so the next governor, Union-appointed Andrew J. Hamilton, had the room sealed. Yet the cold breaths, rattling, moaning, and turning of doorknobs continued such that housekeeping staff dreaded this portion of the house, avoiding it whenever possible. The situation remained so until well into the twentieth century when the room was unsealed. The sounds even then were said to still be heard, especially on Sundays, the day on which he ended his life. Some who tell the tale today say the sounds can still be heard to this very day. The demands of leading the state's war efforts and the contentions with the Confederate military and government took a huge toll on Governor Murrah's health. As late as January 1865, he was exhorting Texans to set aside personal concerns and ambitions and to make the sacrifices necessary to fight on. He continued to do so even after Lee's surrender at Appomattox Courthouse, Virginia, on April 9, 1865, but when it became certain that Union troops would occupy Texas, he stepped down from office and, even with his tuberculosis much worse, joined other Confederate leaders accompanying troops commanded by Confederate General Jo Shelby (one of a few Confederate generals who refused to surrender) in a march into Mexico. Crossing the Rio Grande at Piedras Negras, the troops sank their Confederate guidon into the Rio Grande, which point is now known as the "Grave of the Confederacy." Murrah was confined to bed upon reaching Monterrey, Nuevo León, Mexico, where he died August 4, 1865, and was buried in Panteon Municipal Cemetery. 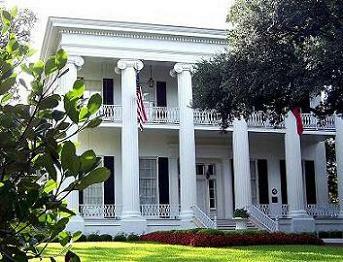 It is rumored that the ghost of Governor Murrah also haunts the mansion and that the apparition has been seen both inside and outside the mansion. Also rumored is that the ghost of a woman is among the spirits of the mansion, the specter of an unmarried maid who was dismissed from employment when her pregnancy became apparent. She waits ouside the house, says one online source, as if in hopes of being invited back. Having undergone several renovations over the years, such as during the Governor William P. Clements administration and the Governor George Bush administration, the historic edifice had again been closed several months while undergoing a $10 million refurbishing when in the early morning of June 8, 2008, it was extensively damaged by fire, the result of arson. Fortunately, countless valuables including Houston?s four-poster bed, Stephen F. Austin?s writing desk, and numerous other valuable pieces of art and antique furniture had been removed and were in storage at the time of the fire. Security cameras caught images of an intruder before the setting of the blaze, but it is not clear if the arsonist acted alone. No one was hurt in the fire; Governor Rick Perry and First Lady Anita Perry, who had moved out of the mansion several months earlier (October '07) for the renovation, were in Europe for an economic development conference. Restorations continue to move forward. A common theme in ghost stories is that spirits become agitated during remodeling or restoration of buildings. Has the tragic fire driven them away? If still around will they remain, perhaps becoming more active because of the commotion of construction? Only time (and tellers of ghost tales) will tell. © October, 28 2010 By: Ronald Howard Livingston, all rights reserved. 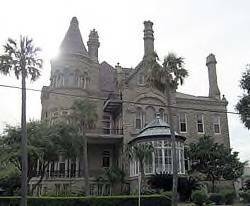 Popularly known as the Bishop's Palace, the immense stone mansion located at 1402 Broadway (corner of 14th at Broadway) in Galveston, Texas, is an incredible sight and indubitably the most photographed landmark on Galveston Island. Designed and built from 1887-1893 (at an estimated cost then of $250,000) by prominent architect Nicholas J. Clayton of Galveston for attorney and politician Colonel Walter Gresham and his wife Josephine (the parents of nine children), the structure is regarded as one of the most important Victorian structures in the United States. At one time called "Gresham's Castle," the ornate edifice of three-stories over a raised basement is in the Châteauesque style (derived from the French revival style). It was constructed from carved limestone (accented with red sandstone, red granite, and gray granite) and steel frame (making the outer walls, including interior wood paneling, twenty-three inches thick). The facade features elaborate carvings of people, plants, animals, and mythical creatures. It has steep roofs and tall turret-like chimneys. Stained glass windows, magnificent fireplaces (one lined in pure silver), wood floors, exquisite paneling, and a majestic wooden staircase distinguish the interior of the 7,500 square foot home. Rare woods constitute much of the elaborate carved features throughout the house, and most of the luxurious furniture is original. Born in Virginia in 1841, Walter Gresham enlisted in the Twenty-fourth Virginia Cavalry at the beginning of the War Between the States, later serving in other regiments. In 1863, he was graduated from the law department of the University of Virginia, and late in 1866 moved to Galveston, Texas, to practice law. Among many important activities and positions, he was elected district attorney for Galveston and Brazoria counties; was director of the Gulf, Colorado and Santa Fe Railway (as well as its second vice president); served in the Texas legislature (1887 to 1891); and was elected to Congress in 1892 but did not win re-election. He returned to the practice of law in Galveston. He died in Washington, D.C., on November 6, 1920, and is buried in Galveston in Lakeview Cemetery. In 1923, the Roman Catholic Diocese of Galveston-Houston (which in 2004 became an archdiocese) bought for $40,500 the Gresham home, which sits across the street from the Sacred Heart Church, and for many years it was the residence of the bishop, Christopher Edward Byrne. In 1963, following the removal of the offices of the diocese to Houston, the diocese opened the home to the public. It has been managed as a museum by the Galveston Historical Foundation since December 2007. 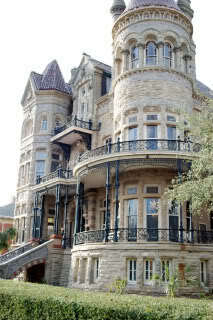 The mansion withstood the Great Storm of 1900 (the Galveston Hurricane) virtually unscathed. It is said that the ghost of Walter Gresham is seen, sometimes appearing to be inspecting the exterior of the building, whenever the island of Galveston is threatened by a storm from the gulf. (The house also suffered some flooding and roof damage from Hurricane Ike in September 2008, but it has since dried out and been reopened.) Other ghosts are said to haunt the home and publications and websites insist the mansion is quite haunted, one website even saying that the ghosts move about there willy nilly. The Bishop's Palace is a Recorded Texas Historic Landmark and is listed by the U. S. Department of the Interior as a National Historic Landmark (and as such it is on the National Register of Historic Places). © June, 22 2010 By: Ronald Howard Livingston, all rights reserved.